The UN chief has warned Donald Trump against abandoning the idea of a two-state solution to the Israeli-Palestinian conflict, saying there is “no alternative”. It comes after Mr Trump went against decades of US policy, saying he would back whatever formula led to peace. Palestinians reacted with alarm to the possibility that the US could drop support for Palestinian statehood. The last round of Israeli-Palestinian peace talks broke down in 2014. Speaking alongside Israeli Prime Minister Benjamin Netanyahu on Wednesday, President Trump promised to deliver a “great” peace deal. But he said both sides must compromise. Following the news conference, UN Secretary General Antonio Guterres urged the international community to do everything it could to bring about a two-state solution. He said there was no other option for resolving the conflict. A “two-state solution” to the decades-old conflict between Israelis and Palestinians is the declared goal of their leaders and the international community. 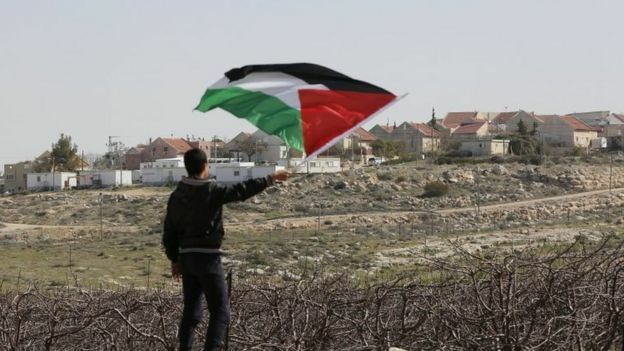 It is the shorthand for a final settlement that would see the creation of an independent state of Palestine within pre-1967 ceasefire lines in the West Bank, Gaza Strip and East Jerusalem, living peacefully alongside Israel. The UN, the Arab League, the European Union, Russia and, until now, the US routinely restate their commitment to the concept. When he was asked about a two-state solution on Wednesday, Mr Netanyahu said he wanted to focus on “substance” and not “labels”. Palestinian President Mahmoud Abbas, meanwhile, said he remained committed to the goal. He also seized on President Trump’s comments urging Mr Netanyahu to “hold back on settlements for a little bit”. Since Mr Trump took office last month, Israel has approved thousands of new homes in West Bank and East Jerusalem, land claimed by the Palestinians for a future state. “State-minus”: Favoured by Benjamin Netanyahu, offering Palestinians enhanced self-rule without full statehood, with a permanent Israeli military presence in the Jordan Valley. Rejected by Palestinians as unacceptable. Confederation: Sometimes referred to as the “three-state solution” comprising an Israeli and/or Palestinian confederation with Jordan, the majority of whose population is Palestinian. Floated as an idea down the years but has never taken root as an option favoured by any of the parties. Unilateral withdrawal: Also known as “constructive unilateralism”. Envisages an Israeli pull-back on its terms from parts of the West Bank, setting its own borders and separating itself from the bulk of the Palestinian population. Assumes failure of peace process and has no support among international community. The Israeli government is hoping for better relations with the White House after eight years of friction with the former Obama administration. At Wednesday’s news conference, neither leader committed explicitly to back a future independent Palestine, a longstanding bedrock of US policy. It was the US and Israeli leaders’ first face-to-face meeting since Mr Trump’s victory in the 2016 presidential election. But France, which in January organised a multi-national conference which reaffirmed support for a two-state solution alone, seemed unimpressed with the apparent change in direction. Its ambassador to the UN, Francois Delattre, told reporters “our commitment to the two-state solution is stronger than ever”, according to AFP news agency. Regional media reaction: Refreshing or reckless? But Barack Ravid – in left-of-centre Ha’aretz – accuses Mr Trump of acting “recklessly” in apparently conflating the one state and two-state plans. For the pro-Fatah Palestinian newspaper al-Quds, Mr Trump has shown he is close to Israel’s position, and that the two-state solution has “withered”. In Gaza’s Hamas-run Filastin daily, Fayez Abu-Shammala says it is “wonderful” that the White House has shown its “real position” rather than acting as “an enemy pretending to be a friend”. He adds that the “time for resistance has come”. 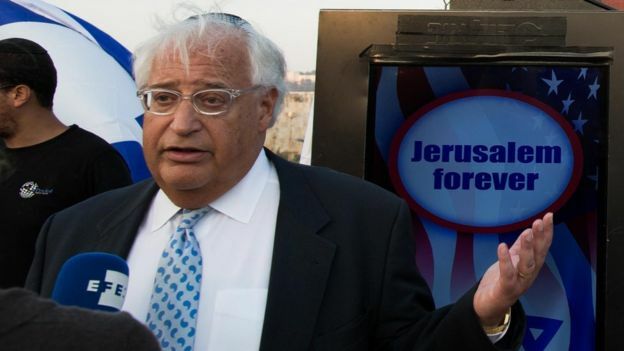 Meanwhile, Mr Trump’s choice for America’s next ambassador to Israel, David Friedman, faces a rocky confirmation hearing before the US Senate Foreign Relations Committee on Thursday, the Associated Press reports. The right-winger is a strong critic of the two-state solution, supports Jewish settlement building and moving the US embassy to Jerusalem. Five former US ambassadors to Israel have written a letter to committee members declaring him unqualified because of his “extreme, radical positions”, AP says. The Palestinians want East Jerusalem as the capital of their promised future state – but Israel claims the entire city as its undivided capital.